that tests whether siblings’ character traits are really so different, or just different expressions of the same personality. Southampton Cultural Center. Performances continue weekends through April 27. “True West” ends can be debated. What is certain is that the lives of two brothers explode in a suburban home. The games truly begin when the chance of a lifetime walks through the door when the parent is temporarily away. can from the neighbors while grabbing a large proverbial stick and poking his brother until he bleeds. s screenplay idea, the showdown begins for the two brothers. brothers Dennis Quaid and Randy Quaid also shared the stage. best director and best play. 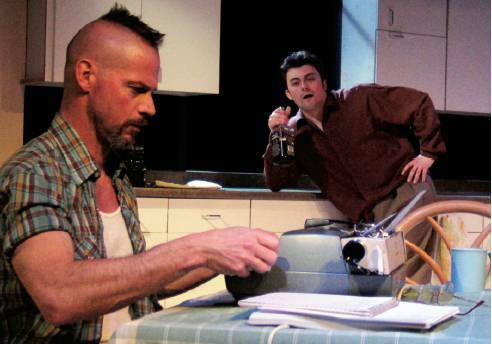 At the Southampton Cultural Center, “True West” features actors Kirk Gostkowski and Joe Pallister playing the embattled brothers. Mr.
family to write his screenplay in the silence of his mother’s house. handpicked for “True West” after Mr. Disher worked with him in “Doubt” by John Patrick Shanley for the Hampton Theatre Company. Mr.
the role of the mother. explained that character development and intention are left as ambiguous as the meaning of the play and how it ends. was an opportunity he didn’t want to miss. “True West” opens on Friday at 7 p.m. at the Southampton Cultural Center’s Levitas Center for the Arts, 25 Pond Lane, Southampton. under 21 years old. For reservations, call 287-4377 or e-mail scc@southamptonculturalcenter.org. Click here for a link to the Southampton Press site that also hosts the article.